Cruisers Yachts has earned a reputation for ground-breaking interior design, and they continue to explore new territory with the Cruisers 42 Cantius. Look at almost any model of a modern cruising boat in the 40- to 60-foot range and you can find design elements that are traceable to the original Cruisers Cantius 48 Sports Coupe, introduced in 2010. The atrium design, which brings natural lighting belowdecks? That was first seen on modern cruisers in the Canius 48. A saloon surrounded 360-degrees by windows? Ditto. Designed specifically for Volvo Penta IPS drives? Well, maybe the Cantius wasn’t the first, but it certainly was an early adopter. Considering the importance of all these trends in boat design, it should be completely clear that Cruisers Yachts is a leader, not a follower. And it’s proved this once again with the new 42 Cantius. First, for what hasn’t changed: the 42 still features bright natural lighting inside courtesy of 360-degree windows, a glass aft cabin bulkhead and doors, and a huge sunroof that slides back at the press of a button. And it still has the atrium over the companionway, allowing sunshine to penetrate belowdecks to the lower cabin. The master stateroom is a full-beam mid-cabin, with full headroom throughout except for over portions of the king-sized berth. It also has a settee, cedar-lined hanging locker, and flat-screen TV. The forward stateroom is for guests with a queen berth and similar amenities. One nice surprise: both staterooms have private heads, a rarity on a 42-footer. In the saloon, however, some major changes become apparent. The interior layout is completely different from the older Cantius line and is designed to reflect changes in the way people tend to use their boats. These days, less cooking goes on inside the cabin and more takes place at outdoor grills; hence, the minimalist galley inside the cabin and the large electric grill built into the transom of the boat. The galley has also moved back to abut the aft cabin bulkhead on the port side, and the dinette is in the same position to starboard. Slide open the huge cabin doors, and that dinette is essentially connected to the open cockpit. Shuttling back and forth between the galley, grill, and dinette with your fresh mahi-mahi fillets and burgers is a piece of cake. Forward and across from the helm, where the dinette was located on the original Cantius, there’s a large center-facing settee. On the forward end it’s capped off with a convertible seatback that can face forward or aft. The starboard-side helm has a large electronics flat screen with twin monitors plus a digital engine monitor display, a custom Cruisers steering wheel, and a double-wide helm seat. Another new development for the Cantius line can be found up forward on the bow. While the older Cantius design had a (mostly) flush deck, the new 42 incorporates a rather well-developed bow lounge. It’s not just a sunpad, as is often the case on boats of this size, but has twin pads with swing-up backrests that convert them into loungers and a recessed center section with cup holders and a table. The hatch for the forward cabin is in the recess, so wise owners will warn everyone aboard not to walk on it. (Yes it can support the weight, but over time stepping on these hatches does take a toll). The cockpit is unique to the 42 as well, though there aren’t any shocking developments here. There’s a large L-shaped settee, and you can opt to have a refrigerator and/or ice maker in the cockpit. It’s capped off with a massive swim platform that can be lowered hydraulically (if you opt for the upgrade) and a set of swing-down steps that connect it with the cockpit, even when the platform is underwater. A pair of 370-horsepower IPS 500 Volvos is standard fare for the Cantius 42. Most boaters will find this to be plenty of power for a cruiser of this nature, with cruising speeds in the mid 20-knot range and a top-end in the low to mid 30s. And, of course, with this package you get that phenomenal IPS pod drive handling. 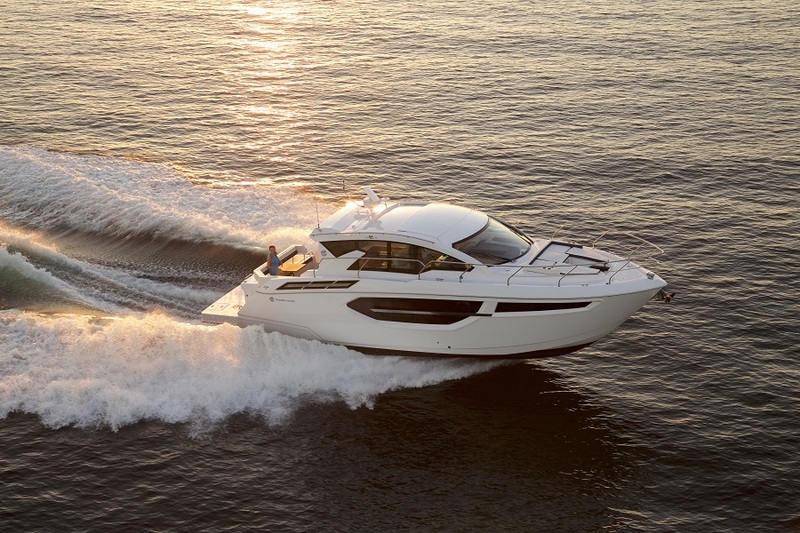 Is the new Cruisers 42 Cantius as ground-breaking as that original 48? No, but few boats—very few—are. It is, however, a significant refinement of the original concept which so many builders have mimicked. And it represents an evolution that makes the Cantius better matched to today’s boaters.